This and That » pwm - What else would it be? I decided to swing by RadioShack after work yesterday and see what kinds of fun components I could snag. I came across this tri-color LED ( datasheet – FYI: the green and blue pins are accidentally swapped in the data sheet ) from RadioShack for $2.99. I’ve been looking at the same thing over on SparkFun – I just hadn’t gotten around to placing an order yet. 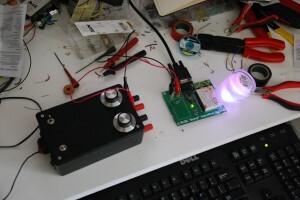 What follows is the simple circuit and software I wrote to give this cool LED a test run. 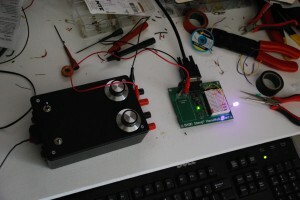 I used a Basic Stamp 2 module, 3 resistors and the LED. First of all, this is how you hook up the circuit. Those resistance values are calculated using the typical voltages on the data sheet. I limited the amperage to 20 mA to protect the Stamp module and prolong the LED life. I didn’t have 75Ω on hand, so I substituted 82Ω. 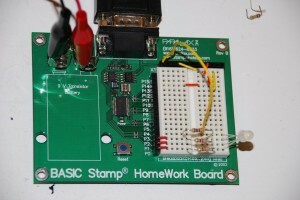 Here’s a picture of the HomeWork Board I used to wire up the circuit. Ignore those wires at the top of the breadboard – that was for another project. 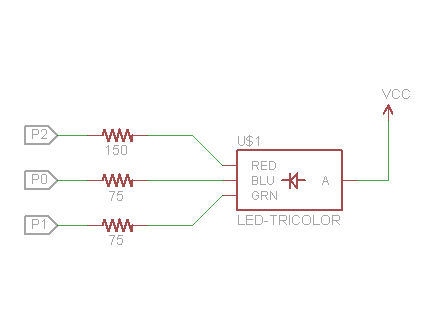 Use PWM to output a very short ( 1ms ) burst of analog voltage according to the corresponding variable for each color. The astute will note that it's actually more of an "input" of voltage, as the current actually flows from Vcc through the LED and into the Stamp. Remember this when calculating current draw, as the Stamp can only sink 25mA per pin, and 50mA total per IO pin bank. Decide randomly whether you're going to adjust one of the delta factors. This helps minimize the number of times you're doing extra comparisons and math. We have to keep those operations to a minimum because the LED is not lit during that time, and the longer you take to relight the LED, the more flicker you'll see. If you are adjusting a delta, just randomly pick one to flip. If one of the values gets too low or too high, flip the delta and re-add so you don't roll around, because the Bytes will roll over from 0 to 255 and 255 to 0. If you let that happen, the particular color it affects will suddenly turn on or off. Feel free to tweak some of the numbers. You can achieve some neat effects by stretching out the output times, playing with which colors vary when, or even expanding the code to vary more than one delta at a time. Here are a couple of action shots for your amusement. Enjoy!